Sterling silver is a great way to commemorate something don’t you think? I like sterling silver. This is no secret. I like to make necklaces. I like even more giving them away. So last weekend when my running group ran a 1/2 marathon (our first together, but for some ladies it was their first all around! ), a friend and I decided to give them something that would commemorate what we all accomplished. I have to say I really like how they turned out! It says 13.1. You’d think so we could remember the 13.1 miles we raced. But it’s much more than that. It’s to remember the early mornings, the sore knees, the great conversations, the long runs, the laughing, the getting lost on long runs, the goats staring at us on the country roads when we were the only things awake and moving, the nerves, the planning, the following through, the friendship. I’d say it says alot. Do you know someone that could use a good reminder? We have this necklace in any distance- and with any stone! Click here to order yours! This is our classic name necklace. A perfect birthday, baby shower, or any day gift! Younger girls love to wear their own names, and moms love to show off their kids names. Who do you know that could use a little pick me up gift? How about a fun name necklace? Our new lower case font has been very popular and we think turns out quite cute! Of course, all charms and chains are 0.925 sterling silver! 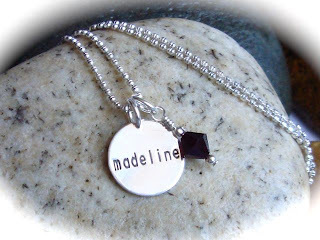 Add a Swarovski birthstone crystal to jazz up your necklace and personalize it even more. Click here to order yours!